AllegroMedical.com presents The Figure 8 Elbow Support. 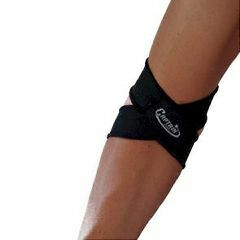 The Captain Figure-8 Elbow Support (Elbow-Aid) is a light-weight, comfortable and perspiration absorbent elbow support that provides constant support to the tendons of the elbow. The Captain Figure-8 Elbow Support was designed for the demands of active person, and constructed stay in place, withstand physical activity and provide all-day support.